I have so many common threads with the lovely story Dogger... I too, like Dave had a cuddly toy that i could not be separated from when i was a child and i remember well one cold lonely night when i had to go to bed without my teddy.Family is a constant throughout many of Shirley Hughes' stories, with brothers and sisters introduced and featured as main characters within the the story. In 'Dogger' i could relate both to Dave and his love for dogger and Bella being the kind older sister - I wasn't always kind, but i was an older sister.The school community is also a central theme to the story with Dogger lost when they go to collect Bella from school and found at the school summer fete. The summer fete features many activities that were common place when i was at school but when i recently read this story to a small group of year 1 children I found myself having to explain many of the activities that are illustrated. The fashion is different as well and it makes a good starting point with younger children to get them to think about whether the story is set in the past or present.During the search for Dogger the illustrations are smaller and laid out in a way that seems to emphasize the panic and eagerness to find poor old lost Dogger as mum tears the house apart looking for him. I love the illustration where Dad is out in the garden with a torch and Bella and mum stand by the door while dave looks forlornly out of his bedroom window.In many of the illustrations there is loads going on and every time you read it you see more details. The layout of both illustrations and text makes the reading really interesting. When dogger is finally found on the toy stall and the little girl buys him for 5p the tension builds and you wonder what might happen but good old Bella saves the day trading her new, shiny blue bow, bear that she won in the raffle, for dogger. What a lovely sister. 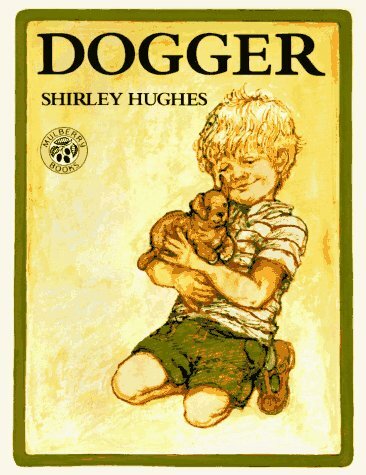 ‘Dogger’ By Shirley Hughes.I read this story as a child and its one of those most memorable stories from my childhood. It has stayed in my family for many years and I have read it on numerous occasions to my own children who have enjoyed it just as much.It’s about a young boy called Dave who looses his precious soft toy called dogger and as a result he becomes very sad. After searching far and wide dogger is eventually spotted by Dave in his schools summer fair. It so happens that Dave doesn’t have enough money to buy dogger and a young girl buys it, this makes Dave very upset. Dave’s sister Bella does something very special to re-unite Dave and Dogger once again.The great detailed illustrations in the book add to the delightful experience of reading a wonderful story. I would definitely recommend this book for children in EYFS and KS1. This was a wonderful story about loss, gain, friendship and family love! Most assuredly worth reading with your child. The love a child can have for a favorite toy and what happens when it is gone. Be warned, your child may be a bit sad for awhile but be sure to finish to the end! Very much worth a family or bedtime read! It has a 4 for nostalgic reasons. I had to include his in my reading log because it is one of my favourite childhood stories. I was reading it to my son and just had flashbacks of my childhood! Love this book. This enchanting tale follows the love affair between a boy, Dave, and his most treasured possession, his toy dog, Dogger.The eldest out of three, Dave is always accompanied by his Dogger. His baby brother has his ‘hard toys for chewing on’, his sister Bella has her teddies, but Dave finds full satisfaction in his Dogger. They are inseparable.It is therefore a cause for much dismay when after collecting his sister Bella from school, Dave realises that Dogger is no longer with him. In fact, he has no idea where he is! Despite Bella’s kindness in lending him a teddy, nothing can replace Dogger. The next day is the school fair- a day packed with fun and games for children and parents alike, but Dave is not interested. He just wants his Dogger back. He searches high and low for him until he stumbles across the toy stall where there, to his shock and horror, peeking out from behind the knitted duck and doll, the familiar face of Dogger is staring back at him; with a 5p tag around his neck! Although everything looks hopeless at first, in the end the pair are happily reunited. The combination of good character building, gripping storyline and colourful and extremely detailed illustrations, means that the reader cannot help but empathise with the protagonist, Dave, as the story unfolds. Shirley Hughes manages to capture the simplicity and sincerity of a child’s love for his favourite toy through her narrative and illustrations; a love that many people can relate to. The conflict-resolution plot gives the perfect sense of catharsis for the child reader and turns this book into a must-read.I would recommend this book to a post-beginner reader of around 6-7 years old due to the more advanced vocabulary and longer paragraphs. Shirley Hughes is one of the best known and most popular creators of children's books of all time. She began to write and design her own picture books when her children were very young because she felt there was a gap in this form of literature. She is my favourite children's author, I read her books as a child, I have read them to my own children and I intend to read them to my own class. One of my favourites is the story of a soft brown toy called Dogger. Dogger belongs to a young boy called Dave who takes him everywhere with him. But one day Dogger gets lost and Dave is left really really upset and unable to sleep without him. The next day Dave and his family go to the school fair where Dave sees Dogger on sale for 5p, but he doesn't have enough money and is left heart broken when Dogger is bought by a little girl. His big sister comes to the rescue and swaps a giant teddy for her brothers Dogger, making Dave a very very happy little boy. A fantastic novel to share with children of all ages and a great discussion starter on the importance of kindness. The Shirley Hughes collection is a must have for everyone! I found this book in the book corner in the year 2 class I am currently placed in. Instantly I was drawn to this book as it is one that I remember reading as a child. I read this book with a child this afternoon. I asked the child questions about the book and they were able to give the answers based on what they had heard. This book I would use from year one up to year, adapting the range of questions that I would asked based on the year group. I found in this book that you could ask questions about feelings and get the children to empathise with the characters. As an extension exercise in literacy I would get the children to write an alternate ending to the story and give other suggestions as to what could have happened to 'dogger'. This book would be good to use at circle time also to get the children to talk about things that mean a lot to them and they would be really upset if they lost, or when they have been in a similar situation in which they have helped somebody who was really upset. This will incorporate some SMSC into the discussion. A beautifully well written and well illustrated book, with a lovely message.This story is about a young boy, his stuffed dog ‘Dogger’ and his family. One day after the young boys love for Dogger is in no doubt, Dogger goes missing! The whole family search high and low, but it is nowhere to be seen. The story has a good complication and climax then in the end, as you would hope from a book of this nature aimed at this age group, things all work out in the end. Every page you turn you get a warm glow from the well constructed tale and the beautiful illustrations. As an aspiring primary school teacher I am sure I will use this book many many times in the future. I will look out for other Shirley Hughes books. 'Dogger' by Shirley Hughes tells a lovely story of the importance of a little teddy. The story tells of little boy who misplaces his favourite teddy and finds himself completely lost without it. The story delves into the theme of 'belongings' and of the importance of having special objects to cherish. This story is a great read to share with those children of the EYFS/ early KS1, as it highlights the importance of respecting belongings and of respecting the belongings of others. This book is great to use to inspire circle time and provoke discussion around respect and sharing. I adore this book. There should be more stories that show so naturally, and so authentically, acts of love. • Learn about doing things to make others happy.• Book is easy to read and understand by higher ability key stage 1 pupils.• Can be explained to younger children • Get in touch with feelings and expressing themselves, how would they feel if they lost their favourite toy? When Dave loses his favourite toy, a small, threadbare dog named Dogger, he is very, very upset. His parents search all over the house but can't find Dogger anywhere. Just when all hope is lost, Dave and his family go to the School Fayre, where Dave spots none other than Dogger at one of the stalls! Dogger is for sale for 5p, but Dave can only find 3p in his pocket, and is very upset when he sees a little girl walking around the Fayre with Dogger in her arms. As with all of Shirley Hughes' books, the illustrations are intricate and beautiful with an authentic, homey feeling to them. They are accompanied by a lovely story which many children will be able to relate to, with a positive message of helping others. This book is ideal to read to children from nursery age to Year 3/4 where the children will be able to relate to the attachment to toys that Dave has to Dogger. For younger children, a PSHE lesson/ circle time could stem from this story, with discussion about respecting other people's items and how they may feel if they lost something precious to them. For older children on the other hand, Dogger could be used as a stimulus for creative writing, where children could write about something being lost and found, incorporating thoughts and feelings, and for higher ability children, speech and expressive verbs. I read this book to my Year 1 class today and I think it was really good for story time because I was able to get the children involved asking them questions in relation to the text. I could see by their faces how engaged they were and they were fascinated by all the detailed illustrations. The main character Dave had a little teddy Dog which he adored, I was able to relate it to the children asking them if they had a little teddy or toy they cherished. All of the children at one point had a special bear and I let them into a little secret about my bear Bobby which I've owned since a child. In the story Dave loses his bear "Dogger" at a summer fair only to find that its on a stall and up for sale for more than he can afford. In the end of the story Dave's sister manages to get the bear back by trading in her own brand new giant teddy bear that she won at the fair. This book teaches children how we often get attached to items that signify a great deal of personal importance to us. The happy ending in which Dave gets his cherished "Dogger" back is a result of his sisters kindness and selflessness. The children were so happy for Dave at the end of the book that they cheered and smiled, they were aware of the good deed that his sister had done and as a result they learnt about doing good deeds despite personal sacrifices. Dave's favorite toy is a stuffed toy named Dogger. He carries him everywhere and depends on him to help him go to sleep. One morning, while out with his mother, meeting his older sister Bella at school, Dogger disappears. When bedtime comes, Dogger is nowhere to be found, and although Bella loans him one of her teddies, he is very sad during the night. In the morning at the school fair, Dave is too sad to have fun, and he wanders off from the rest of his family. At one of the used-toy stands he is shocked to see Dogger for sale. He runs to find his parents, but finds only Bella, who returns to the stand with him just in time to see another child walk away with Dogger. Bella saves the day, trading her new teddy bear for the worn old Dogger.This well-written story begins with concrete details and builds to a dramatic crisis and resolution that any child who's had a "lovey" can identify with. Hughes' artwork is wonderfully rendered, with a particular eye to details that emphasize the warmth and closeness of this family. Most importantly, Bella's open-hearted self-sacrifice epitomizes the kindness that siblings ought to express toward one another. Elder and younger siblings will appreciate this story for different reasons. Dogger is an adorable book which follows Dave and his precious stuffed dog Dogger. I think a lot of children would be able to relate to Dave when they think about their favourite toy and how they would feel if they had lost it. Dave searches high and low for him, but Dogger reminds lost. The next day is the school fair Dave is only interested in finding Dogger despite all the fun and games going on. Just as we have given up all hope of finding Dogger, Dave stumbles across the toy stall where there, to his shock and horror, peeking out from behind the knitted duck and doll, the familiar face of Dogger is staring back at him; with a 5p tag around his neck! By the time Dave finds his parents to buy Dogger back, another little girl has bought Dogger! In the end his big sister Bella comes to the rescue as she gives us the big teddy she won at the fair to reunite Dave and Dogger. The book is very touching, and the sacrifice that Bella makes for Dave shows us just how siblings should behave! The illustrations really bring the book to life with the soft colours. I think this book would be suitable for a Key Stage 1 and even EYFS. This was one of my favourite books when I was growing up and I still think that children would enjoy it now, as much as I did when I was their age! A lovely story with realistic and detailed illustrations about a child who loses their favourite toy. He is absolutely devastated! Dave loses his "dogger" and Bella, his sister, helps him get it back. This book childrens book models the kind, caring side of a sibling relationship. This can be used to shows children how families can help each other out. A great story to use for a PSHE lesson, to discuss loss and how loosing something you like can affect you. It can help children to understand feelings they might feel in this situation and develop the strategies they may need to overcome it. This is a wonderful story and pictures will touch you, and stay with you forever. Drippy eye alert! My volunteer said "This books has the wrong label on it.. It is HUB instead of HUG, So I decided to put it in the fix pile. OH, a get this book!! The love a stuffed animals is almost everything!! Nice book! Good sibling story as well!! This is another five-star favorite that I read to my children. It's a gentle, lovely story with sweet illustrations that perfectly captures a child's attachment to his beloved stuffed dog and the generosity of his sister. This book was given to me as a gift when my children were little by a British friend who highly recommended it. I agree with her. This is a lovely book about kindness and helping others. Wonderful! Miss 3 and I like to explore different books and authors at the library, sometimes around particular topics or themes. We try to get different ones out every week or so; it's fun for both of us to have the variety and to look at a mix of new & favourite authors.This was one that I chose for us to read. Shirley Hughes is such a classic! I love the post-war London look to the drawings with her books. Miss 3 thoroughly enjoyed and I'm sure every person has the great teddy bear hunt resonate with them and the genuine misery of a child unable to sleep without their lovey. You can definitely tell that this book written in the 1970s just based on the fact that there is a lovely image of children wearing "fancy dress," and it's the clothing from all different types of cultures. It's a bit weird.Tolerable story on its own, though. Not brilliant, though. It does have a nice lesson about why we need to share, but I think there are far better books available these days that would do it far better. I first read this as "David and Dog" when my boys were very young. Absolutely lovely story about a boy and his favourite toy, and the love between siblings.My 5yo has a special teddy (dumbo) which she cannot be without at bedtime!! This is one of my absolutely favourite books. Such a simple story but utterly charming! Loved this when I was young and then when I revisited it with my little one. This book was a gift for Maeve from my best friend who lives in Scotland. It's a lovely story with wonderful illustrations. Maeve loves it but gets a little upset until Dave and Dogger are reunited at the end. Plot Summary:This story is the tale of Dave and his inseparable teddy dog called ‘Dogger’. Unfortunately, Dave loses Dogger after collecting his sister, Bella, from school. Dave is very uspet over this and nothing can seem to cheer him up, even the school fair the following day. Whilst at the fair, Dave manages to spot Dogger being sold on a stall, but he is too late and someone has already bought it. Dave’s hopes are dashed again and it’s made worse as his sister, Bella, wins a new teddy in a raffle. The end of the story see’s Dave and Dogger reunited, after they finally find Dogger with a little girl and Bella kindly offers the little girl her new teddy in exchange for Dogger’s return.Age Range:6-7, Year 2Positives/ Likes about this book:This story anyone can relate to, as growing up we have all had a favourite toy at some point to which you would feel devastated if anything should happen to it or it become lost. The readers are really therefore able to empathise with Dave. Children too, as this can stimulate discussion into them thinking of their favourite toy and how they would feel if they, like Dave, may lose it. I also like the fact this book really draws on the positives of sibling’s relationships, as most tend to depict a rivalry relationship. How would this book be used in a classroom setting?The book could be used in literacy to get the children to write a similar story of their favourite toy or something they/their character may have lost, did they find it? Was it a happy ending? Perhaps the children could be encouraged to think of alternative endings, what if the little girl did not want to swap? Or what if Dave never managed to spot Dogger at the fair? It could also be used during PSHE, to discuss empathy/feelings and helping. Perhaps getting children to think of kind things they have done to help others rather than themselves. What a great story, and what lovely illustrations! I really liked this picture book, as whilst reading it I found myself thinking of the pictures, as well as the writing, because I am now more aware of how to analyse picture books (thanks Mat! )The first picture in the book is of Dogger, Dave's teddy, which illustrates the point that he accompanies the main character of the book. However, from having this picture on the first page, it showed to me that the teddy is extremely important to Dave because it fills up a lot of the first page!I also noticed that whilst reading the picture book, when we are first introduced to Dave's family, we only see their faces, which therefore demonstrates that they are of some importance to the story. When we realise that Dogger has gone missing, I noticed how illustrations of Dave tended to be rather small, which reflects his loss and emotion over misplacing his beloved teddy. I also noticed that his other toys tended to be outside the frame, which shows that they are considered to be less important to Dave, compared to Dogger. As well as noticing how illustrations have been used to illustrate movement over a double spread, I noticed that at the end of the story, Dave and his sister, Bella, started to appear on the same page. I feel that these accompany the words beautifully because, after all, Bella has done a good thing for her younger brother!After analysing some of the pictures, I have shown to myself how useful this book would be to use within children throughout the primary school. For example, with KS1 we could discuss toys, including the history of toys, and with KS2 we could explore the pictures in this book, as there is so much that you can get from them! Digging through my mums old collection of children's books from when I was a little girl I found this book-it took me back I used to get my mum to read this over and over again! Dogger was a soft brown toy belonging to Dave who he loved dearly, Dogger was his favorite toy and they were inseparable. One day Dave loses him and his kind older sister Belle who tries to make him feel better by giving him one of her favorite teddies. But nothing can make him feel better to him the world is a different place without Dogger. The next day they go to the school fair and there he finds Dogger on a stall on sale for 5p-which he doesn't have. He runs to to get Belle and when she gets there a little girl had brought him, Belle who just won a huge teddy gave the little girl the teddy in return for Dogger.Shirley Hughes captures a child's love for their favorite toy beautifully and the lovely sisterly love Belle has for Dave backed up with the scruffy style of the illustration. I would recommend this book for 6-7 years old because of the long paragraphs. I gave 4 out 5 stars because I felt that although the conflict- Dave losing being sad because of the loss of the toy and resolution Dave getting Dogger back is lovely, I think that in most cases children don't always get the toy back I feel that Dave still would be happy again and realise life does go on with or without Dogger and his world wouldn't of ended if he hadn't found him, but maybe I'm too cynical. Shirley Hughes - Shirley Hughes is the illustrator of more than two hundred children’s books and has won many prestigious awards, including the Kate Greenaway Medal twice. She is the author-illustrator of DON'T WANT TO GO! and OLLY AND ME 1 2 3. She lives in London.